Happy 48th birthday to the Atlanta Braves’ Kent Mercker, who threw a 1994 no-hitter three years after tossing 6 innings of a combined no-no. 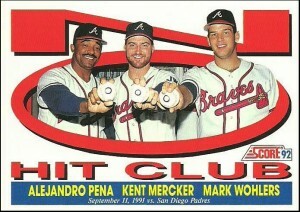 Mercker threw his solo no-no during his first start of the 1994 season. On Friday, April 8, 1994, at Dodger Stadium, Mercker walked four Los Angeles Dodgers, struck out 10 and held the team hitless to lead the Braves to a 6-0 win. Three seasons earlier, on Wednesday, September 11, 1991, Mercker got the start at Atlanta-Fulton County Stadium and threw six innings of no-hit ball against the San Diego Padres. Mercker had been making just his second start of the season and was used to pitching just two innings at a time, so manager Bobby Cox gave the ball in the seventh to Mark Wohlers, who followed with two hitless innings. Alejandro Pena got the first two outs in the ninth before the Padres’ Darrin Jackson hit a slow roller toward third base. Terry Pendleton charged the ball, which took a big hop, and Pendleton made a stab at it. Jackson reached first, and official scorer Mark Frederickson ruled it an error. Pendleton said he was fine with taking the E-5, and the Braves had their combined no-no.